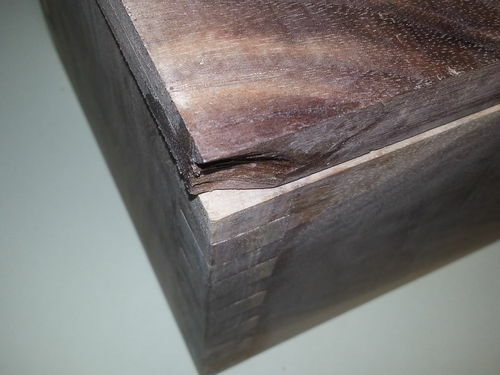 While trying to size my box, I got a chip-out on the front corner of the lid when I tried to use my jointer to square up the top before mounting. 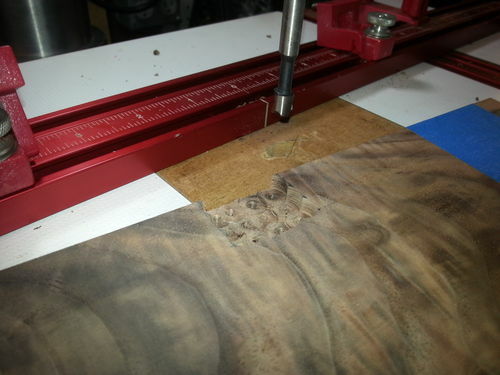 The jointer ate most of the chip, and I only found a small part the was glue-up fixable. My guess is that Claro Walnut, having grain direction all over the place, seems to be VERY susceptible to tear-out/chip-out. How best to to fix this? Wood putty? 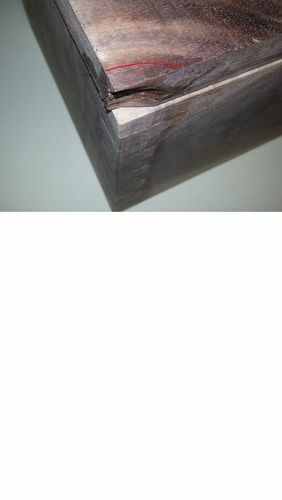 How best to round over finger joints and top? 4. Quarter sheet sander? This would take forever. almost looks like it was a knot. 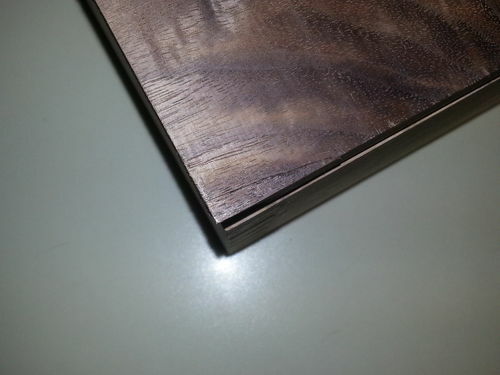 What about some edge banding of some sort? Shave it down some and have some contrast wood. You could cut it off following the grain then replace it with a matching piece of wood. You will always see the line but if it’s within the grain it helps hide it better than anything else. Fine work and repair, to fix is as important as to make. You will always see the line but if it s within the grain it helps hide it better than anything else. I got to thinking something like what you suggest, however with my talents or lack there of, I am thinking that the cut-away and replacement need to be on a straight line. Maybe angled at a 45 to help hide the defect/flaw/F-up from view directly overhead. That piece I found and glued back pretty much covers the entire top corner. 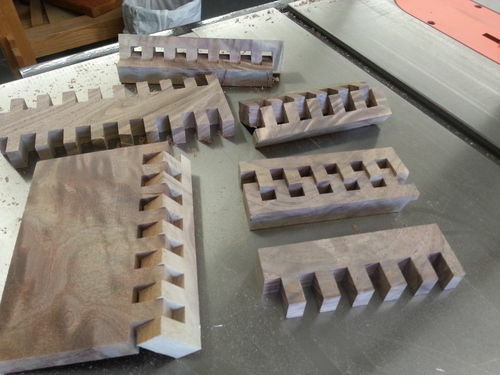 So… I need to keep the end grain going in same direction. That should cover both the side and the front corner of the lid. As you can see in the first image, I have plenty of scrap to work with. I just need to figure out “how” to set up my TS cut, PLUS how I will hold the repair and lid while cutting. I assume you don’t have the piece that came out of it… If you have it, glue it back on… fill slight gaps with a sawdust slurry of white glue. Cut a straight (or a controlled part of a circle) line next to broken area to get a consistent edge. Cut another piece, from other wood, matching the best that you can with the grain and Glue it on. ... Wood putty would make real MESS out of it. I assume you don t have the piece that came out of it… If you have it, glue it back on… fill slight gaps with a sawdust slurry of white glue. Try to see it as a charm. 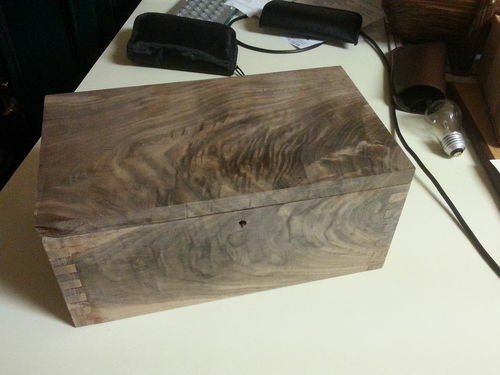 Or make the fix visible, perhaps with a dovetail. like this it will be a story, not a mistake, the Japanese do that. Part of a star… Angled dovetail… Part of a circle… etc. Yes, great idea! However I have already glued a piece on the area and am hoping for the best! ANd no there are no answe, thats what we slowly learn in life.